One day, God sent an angel to carry a message to a young woman in Nazareth. In the painting above, we see a depiction of the scene. 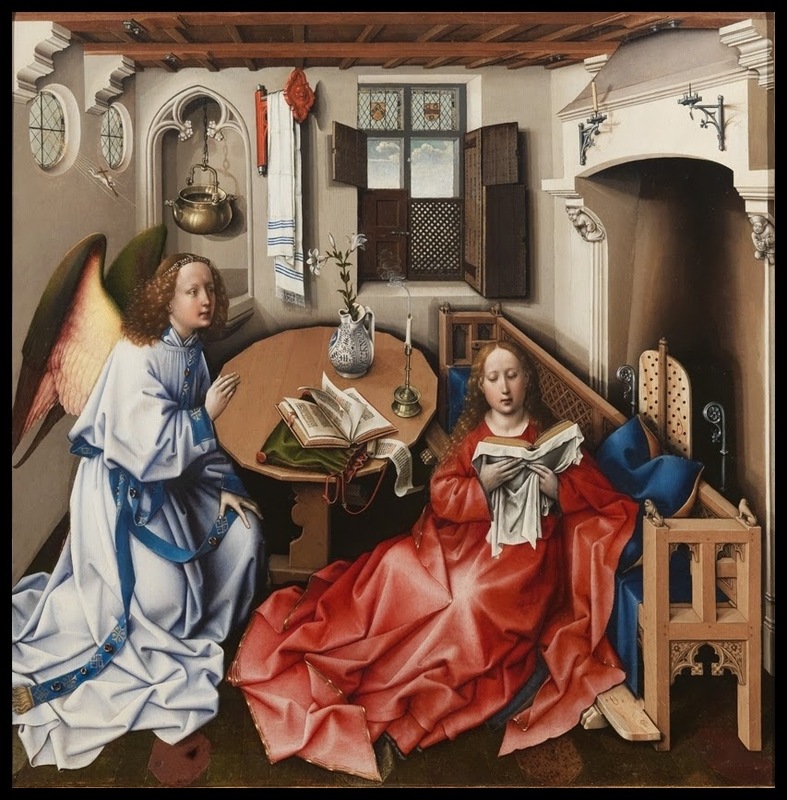 The artists offer a 15th century Netherlandish interpretation of the story of the Annunciation as related by the evangelist Luke in the first chapter of his gospel. For us today, as well as for people who lived in the Netherlands nearly 600 years ago, the Biblical story is far removed from present experience. To enter the scene requires an act of sympathetic imagination. The early Netherlandish artists were poets of the imagination. In their extraordinarily beautiful works, time and space are collapsed. Past, present, and future merge together into one; a house in Nazareth becomes a house in Belgium which stands for a house anywhere… everywhere. Through contemplation of their paintings, viewers are invited to enter into the scenes as part of the work of devout meditation. 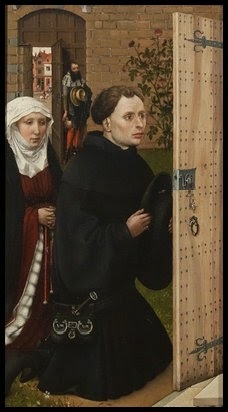 Standing prayerfully before the Mérode Altarpiece, a masterpiece of early Netherlandish art by Robert Campin and his workshop, you might consider the perspective of the donors on the left, Joseph on the right, or Mary front and center. Each perspective would offer different avenues for exploration of the painting and its themes. In the left panel, the contemporary donors approach the story reverently but are forever kept at a distance—they are outsiders gifted with a view of the miraculous, once removed. In the right panel, Joseph models a conscientious, methodical approach to the task at hand (the task being the work of salvation). These characters are models meant to encourage us. It is good to be like a reverent, wealthy donor. It is good to be a diligent worker like Joseph. But on a much grander scale, Campin calls for everyone, regardless of gender, to identify with Mary in the magnificent center panel of the triptych. Her unexpected meeting with the angel Gabriel has cosmic implications; everything on earth and in heaven will hinge on her response. She has the freedom to say, “I am the handmaid of the Lord” or, conversely, she has the freedom to say, “remove this cup from me,” as Jesus would later consider requesting in the Garden of Gethsemane. Perhaps she even has freedom to decline to acknowledge the presence of the angel in the room—to continue reading her book, her eyes fixed on the expected rather than the unexpected. When Campin and his workshop artists painted this triptych in the early 15th century, there was a religious movement in the land called Devotio Moderna, a turn toward a set of monastic-based practices of humility, obedience, and simplicity. It was a pre-Protestant critique of the wealth and empire of the dominant Catholic culture, offering a deep spirituality accessible to the growing middle class. As part of the rather mystic approach of Devotio Moderna, Christians were called to meditate on Biblical scenes as if they were inside them—to imaginatively converse and interact with the characters within the scenes. by the Workshop of Robert Campin. 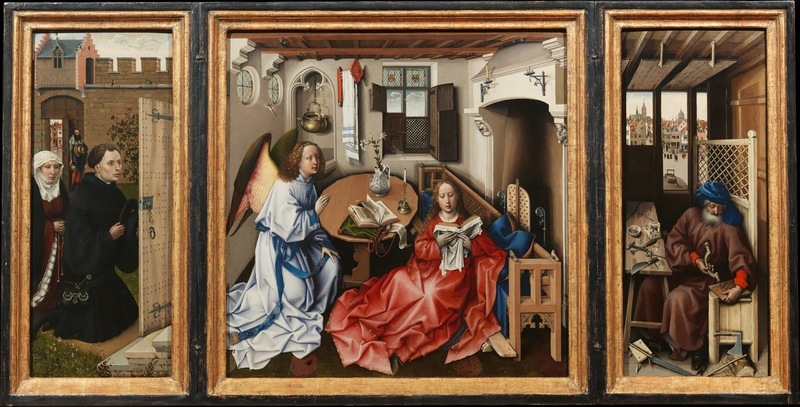 Some art historians believe that the early Netherlandish artists like Robert Campin intentionally created some of their artworks to serve as instruments for meditation in the new Devotio Moderna style. Deep in reverent prayer, you enter the scene. The time that separates you by 2,000 years from an ancient—and seemingly irrecoverable—reality becomes meaningless. The deep past is no further away than the second that just passed. Similarly, the vast distance that separates you from Nazareth becomes meaningless. It is all holy space. The moment is now, in Nazareth twenty centuries ago. The moment is now, a cloudy day in Belgium six centuries ago. The moment is now, experiencing the painting in The Cloisters in Washington Heights, New York City. The moment is now, wherever you are. There’s an angel in the room.